Abbey Yoder honored for her achievements in and out of the classroom. 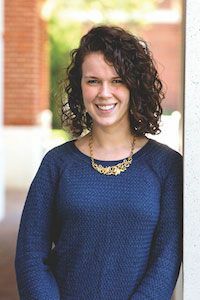 The National Association of Social Workers (NASW) Virginia Chapter has awarded Christopher Newport University senior Abbey Yoder the 2017 Bachelor’s in Social Work Student of the Year Award. Yoder was recognized for her outstanding academic work, leadership qualities and accomplishments in field work. Yoder, a Bonner Service Scholar, works with a local refugee resettlement agency to improve the lives of Bhutanese refugees in Newport News. She developed and led a language program for the refugees, enlisting student volunteers to teach and work with the Bhutanese population to help improve their English skills. The team also worked with the refugees on information needed for the U.S. citizenship test. "Part of our obligation to be global citizens is to make a commitment to service and giving back," says Yoder. Yoder will graduate from CNU this May and plans to pursue graduate studies in social work at the University of North Carolina. NASW is the largest membership organization of professional social workers in the world, with 132,000 members. NASW works to enhance the professional growth and development of its members, to create and maintain professional standards, and to advance sound social policies.